I, like many of you out there I am sure, once thought to myself, “Hey, I’ve seen the chase scene from Bullitt about 900 times. I should watch the whole movie. It’s probably good.” No. It’s not. Run while you still have a chance. 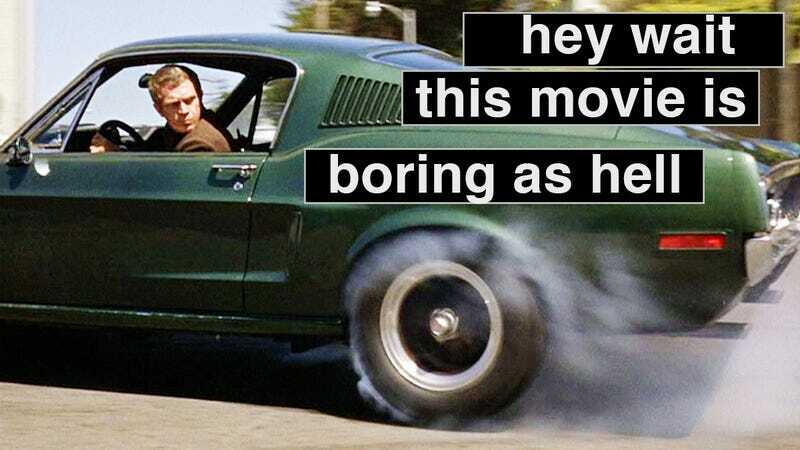 Bullitt is possibly the most boring film to ever get not just a cult following but total and enduring mainstream adoration. The pacing would best be described as glacial, and even the highlights are difficult to sit through. Steve McQueen wanders around an airport. Apparently the movie got an Oscar for Best Editing, which is funny because the movie is probably best known for its continuity errors. The Dodge Charger in the chase scene somehow loses eight hubcaps, and the same Volkswagen Beetle is passed four different times. There’s a new Bullitt-edition Ford Mustang out this year and it’s as desirable as ever, manual-only with sweet, deep green paint and a cue ball shifter. Just don’t confuse the goodness of the car with the quality of the movie to which it owes its name.